Renewal by Andersen has been recognized for “Highest in Customer Satisfaction with Window and Patio Door Manufacturer Brands,” according to the J.D. Power 2018 Windows and Patio Doors Satisfaction Study. The company also achieved the highest score in the Operational Performance and Durability study factor. This is the third J.D. 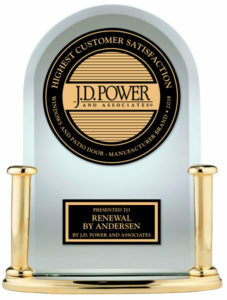 Power recognition in the last four years for Renewal by Andersen. The J.D. Power Windows and Patio Doors Satisfaction Study, now in its 12th year, measures satisfaction among customers based on performance in several factors. The manufacturer brand segment measures satisfaction among customers based on performance in three factors (in alphabetical order): appearance and design features; operational performance and durability; and warranty. J.D. Power is a global leader in consumer insights, advisory services, and data and analytics. These capabilities enable J.D. Power to help its clients drive customer satisfaction, growth, and profitability. Renewal by Andersen LLC is the start-to-finish window replacement division of Andersen Corporation, winner of the U.S. Environmental Protection Agency’s 2018 ENERGY STAR® Partner of the Year – Sustained Excellence Award. Renewal by Andersen offers a replacement process that includes an in-home consultation, custom manufacturing, and installation through one of the largest nationwide networks of window replacement specialists.